Myanmar National Airlines (MNA) plans to launch services on the highly competitive Yangon-Singapore route in Aug-2015 as it starts to implement an ambitious international expansion plan. The newly rebranded government-owned carrier took delivery of the first of 10 737-800s in Jun-2015 and plans to operate five international routes by early 2016 as it grows its new narrowbody fleet. But the airline faces huge challenges as it operates outside the domestic market for the first time in two decades. The Yangon-Singapore market is already experiencing overcapacity and Myanmar-based carriers have struggled to compete against their Singaporean competitors, forcing cutbacks at Myanmar Airways International (MAI) and the withdrawal of Golden Myanmar Airways. MNA will inevitably face the same challenges in Singapore as other Burmese carriers, particularly given its brand is an unknown in the international market. North Asia, which MNA plans to enter in the coming months, will also be a challenging market. This is Part 2 in a series of reports on the Myanmar market. The first report looked at the highly competitive domestic airline market, where there are now 10 competitors following the launch of APEX Airlines and FMI Air and the resumption of operations at Air Mandalay. 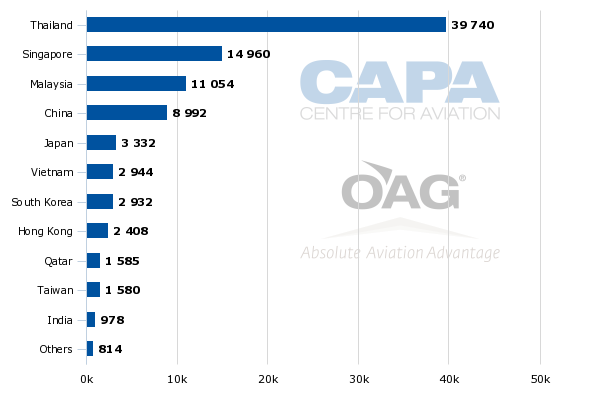 As CAPA highlighted in the first report, MNA is the largest domestic carrier in Myanmar, serving nearly 30 destinations with a fleet of 12 aircraft. Part 3: Myanmar international airline market Part 3: A steep slowdown in growth. Has the bubble burst? Parts 1 and 3 were published on the CAPA premium portal. Please request your PDF copy free of charge by sending an email to capa@centreforaviation.com. Myanmar currently only has three international carriers, Myanmar Airways International (MAI), Air Bagan and Golden Myanmar. MAI is entirely an international operator while Air Bagan and Golden Myanmar currently only operate one international route – Yangon to Chiang Mai in Thailand in both cases. MNA initially decided in early 2014, when it was still known as Myanma Airways, to expand into the international market. The airline last operated international services in 1993, when MAI was established as the international flag carrier, leaving MNA to the domestic market. The opportunity for MNA to return to the international market essentially opened in 2013 when the government sold its remaining stake in MAI to Myanmar bank KBZ, which also owns one of Myanmar’s 10 domestic carriers. 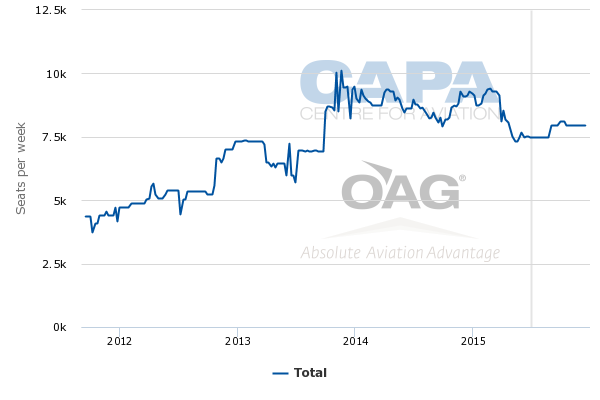 In Feb-2014 MNA signed a lease deal with GECAS covering 10 737s, including six current generation aircraft and four 737 MAX 8s. The six 737-800 delivery slots assigned to MNA included three in 2015, with the first slated for Jun-2015, two in 2016 and one for 2017. Over the last 17 months the airline has been implementing a restructuring and preparing for international operations, with support from GECAS’ consulting arm AviaSolutions. Part of the preparations included corporatizing the airline and a rebranding. The MNA rebranding was completed in late 2014 with the aim of adopting a brand which is more suitable for the international market. In announcing the delivery of its first 737-800 on 15-Jun-2015 MNA stated the aircraft will be used to pursue international expansion starting with Yangon-Singapore service in Aug-2015. It stated that four more destinations in Asia-Pacific will be launched by early 2016. MNA has not yet set an exact launch date and schedule for Singapore or confirmed any other international destinations. But previously the airline indicated it was considering Malaysia and Thailand in Southeast Asia and China, Hong Kong, Japan and South Korea in North Asia. Along with Singapore these are all among the eight largest international markets from Myanmar. Singapore is currently the second largest market from Myanmar after Thailand. There are currently 40 weekly return flights between Singapore and Myanmar, providing about 15,000 weekly seats, according to CAPA and OAG data. All 40 of the flights are on the Singapore-Yangon route except for two SilkAir flights which operate on a Singapore-Yangon-Mandalay-Singapore routing. Total capacity between Myanmar and Singapore has increased by about 50% over the last three years, according to CAPA and OAG data. According to Myanmar DCA data, 620,000 passengers travelled between Myanmar and Singapore in 2014, representing growth of 53% compared to 2012. As CAPA has previously highlighted, the growth has been driven primarily by Singapore Airlines Group expansion as both SIA mainline and LCC subsidiary Tigerair have entered the market. SIA launched Singapore-Yangon in Oct-2012, supplementing longstanding service on the route from regional full-service subsidiary SilkAir. Tigerair launched the route one year later, in Oct-2013. The Singapore Airlines (SIA) Group currently has a leading 62% share of total seat capacity and accounts for 23 of the 40 weekly flights in the Myanmar-Singapore market including nine from SilkAir, seven from SIA mainline and seven from Tigerair. Jetstar Asia, which also has added capacity to Yangon over the last two years, currently has 10 weekly flights and a 24% share of capacity in the Myanmar-Singapore market. MAI has seven weekly flights and accounts for the remaining 14% share of capacity. The Singapore market could seem attractive to MNA given the rapid growth that market has recorded and the very small share currently held by Burmese carriers. MNA may also see a potential void in the market that was left by Golden Myanmar Airlines when it suspended services to Singapore in 2H2014. While total seat capacity in the market has increased significantly over the last couple of years, capacity is currently down by about 15% compared to Jul-2014 because of Golden Myanmar’s withdrawal. But Golden Myanmar struggled on the route and MNA could face similar challenges. MAI also has struggled in the Singapore market over the last two years, prompting it to reduce capacity. Singapore-based carriers have a huge advantage as they are able to offer connections beyond Singapore. A large portion of Myanmar-Singapore passengers travel beyond Singapore. Myanmar still has limited non-stop connections despite rapid growth in inbound visitor numbers. For example there are currently no non-stops to Australia, Europe or Indonesia, all of which are very well served from the Singapore hub. The Singapore-based carriers also have strong and much more widely recognised brands in the international marketplace. MAI relies and Golden Myanmar relied mainly on outbound traffic, including labourers heading to Singapore for work. This segment of the market is relatively limited and not growing as fast as other segments. Such traffic is also generally low yielding with seasonal and directional imbalances. According to Myanmar DCA data, Golden Myanmar carried just under 60,000 passengers in the Myanmar-Singapore market in 2014 while operating 572 flights, which translates into an average load factor of only 58%. This represented an improvement over 2013, when Golden Myanmar carried slightly over 40,000 passengers while operating 536 flights for an average load factor of 43%. But the load factor and yields remained unsustainably low, giving Golden Myanmar little hope that the route could be viable over the long-run. Golden Myanmar initially launched services to Singapore in Apr-2013. As a result MAI’s traffic to and from Singapore has dropped an alarming 36% over the last two years. The overall market has increased by 53% during this period. MAI’s market share has therefore dropped from 30% in 2012 to only 12% in 2014. Most of MAI’s share has been picked up by Singapore-based LCCs. Jetstar Asia has grown its Yangon traffic by 115% over the last two years as its share has grown from 16% in 2012 to 22% in 2014, while Tigerair has quickly captured a 13% share. SilkAir's Myanmar traffic has dropped by 41% but this has been offset by a large gain at SIA mainline as one of SilkAir's Yangon-Singapore flights was transitioned/up-gauged to SIA in Oct-2012. The SIA Group overall has grown traffic in the Myanmar-Singapore market by 57% over the last two years including by 30% in 2013 and by 21% in 2014. Note: includes Yangon-Singapore and Mandalay-Singapore routes. Mandalay-Singapore accounted for only 8,703 passengers in 2014 and 1,906 passengers in 2013. LCCs have accounted for most of the growth in the Myanmar-Singapore market, including most of the growth at the SIA Group. LCCs accounted for 45% of passenger traffic in 2014 compared to only 16% in 2012. But MNA will not easily be able to capture passengers that are now flying with the LCCs. Jetstar is extremely well established in Myanmar market, becoming the first LCC to serve the country, in 2005. Jetstar’s average load factor on the Yangon-Singapore route was 85% in 2014 as the airline benefitted from a large increase in the number of transit passengers. Tigerair’s load factor was much lower, at 67%, but Tigerair only entered the market in Oct-2013 and is only starting to pursue connections beyond Singapore including links with long-haul low-cost sister carrier Scoot. MNA is unable to offer the connectivity of either LCC and does not have low enough costs to match Jetstar or Tigerair fares without incurring large losses as it is a full-service airline with limited scale. Competing with SIA and SilkAir will also be extremely difficult given the connections the SIA Group can offer beyond Singapore and its strong presence in the corporate sector. Ultimately MNA will compete mainly against MAI, a predicament Golden Myanmar also faced during its year and a half in the Singapore market. Unfortunately for Myanmar’s carriers this is virtually a zero sum game as this end of the market has not been growing. MAI and Golden Myanmar combined carried only slightly more passengers to and from Singapore in 2014 than MAI alone carried in 2012. MNA could potentially grow the market by offering connections beyond Singapore. But it will not be easy to forge partnerships as MNA is completely new to the international market and is not yet IOSA certified. Most airlines that serve Singapore are also already aligned with the SIA Group or Jetstar. MNA will likely face similar challenges at it continues to implement its international expansion plan over the next several months. Foreign carriers have an inherent advantage in virtually every potential MNA market as they are able to offer connections beyond their hubs. Myanmar is also primarily an inbound market and tourists are typically inclined to fly with their home carriers or a foreign carrier with a known brand. This is particularly the case for North Asia, a region to which MNA is expected to allocate the majority of its international capacity. MNA will also likely serve Bangkok as it is by far the largest international destination from Myanmar. But as with Singapore, MNA will need to rely on the relatively limited and low-yielding outbound ethnic sector as competing with the four Thai carriers serving the Yangon-Bangkok route for other types of traffic will be challenging. Golden Myanmar recently suspended services to Bangkok, highlighting the challenges Myanmar-based carriers face in this large but extremely competitive market. Korea and Japan are also attractive markets to MNA as the Myanmar government is keen to develop North Asian source markets and stimulate tourism. But MAI’s struggles in establishing operations in Korea and Japan highlight the challenges MNA will likely face in these markets. As CAPA analysed in an earlier report, MAI launched services in Oct-2014 to Osaka in Japan and Seoul in South Korea in late 2014. The new routes from MAI were seen as attempt to grow its international operation ahead of the anticipated expansion from MNA. But MAI’s services to Osaka and Seoul were both short-lived and are no longer being operated. MAI dropped Seoul in late Jan-2015, according to OAG data, while only a few flights to Osaka were operated. As in the case with Golden Myanmar’s withdrawal from Singapore and Bangkok, MNA could see MAI’s setback in Japan and South Korea as an opportunity. But the reality is any Myanmar carrier will face an uphill battle in competing in these and most other North Asian markets. The Myanmar government is taking a big gamble by investing heavily in MNA’s international foray and expansion. Perhaps the government is willing to increase subsidies of the flag carrier, hoping MNA will stimulate tourism and help raise the profile of Myanmar internationally. But there is good reason for the private airlines of Myanmar and foreign carriers that have pursued expansion in the Myanmar market to be irritated. MNA’s ambitious expansion could distort the playing field in several markets, starting with the important Myanmar-Singapore route.